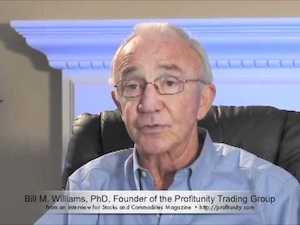 Bill Williams was American trader born in 1932 and author of books on trading psychology who is credited with bringing a lot of useful indicators in the world of technical analysis as well as one of the most commonly used indicators for traders around the globe – the Accelerator Oscillator. By the time it is applied to a chart Accelerator Oscillator presents green and red lines which are going above and below the zero line. The main idea, in this case, is that green lines which are usually placed above the zero line represent bullish conditions and red lines which are below the zero line stand for bearish conditions when trading binary options. When we see green lines, it means that we should be interested in buying call options. However, when we see red lines, it is a sign that we should buy put options. The Accelerator Oscillator performs nicely in ranging environment since it demonstrates overbought and oversold levels in the way that one can find out the turning moment by using this oscillator. The key, in this case, is to observe a bullish trend and look for more than one red line to show up. By the time the oscillator goes into negative territory, and then green lines reappear, call options are recommended. The opposite situation is true as well for trading put options. The Accelerator Oscillator is expected to show overbought and oversold levels, but it is also used when it comes to finding possible divergences in the price. These lines in red and green colors are made in order to be a helpful sign for traders since green represents bullish conditions, and respectively red represents bearish conditions. If you are looking for overbought and oversold levels the best way to go is primarily to zoom out the chart as much as you can do it and then try to apply the oscillator. This option can be found on the MetaTrader trading platform, which among other things makes it the best trading platform in the world. Therefore, open the Insert tab, search for the Indicators category and then open the Bill Williams group. The first option that appears is the Accelerator indicator. Zooming out as it is mentioned earlier can help you find out some old levels in which the oscillator potentially traveled, in addition to the possibility of seeing the extremes. The following step in this process is to choose Edit indicators with the right click on the Metatrader window. Here we can add levels. We can either add them on the top of the range or the bottom of the range. Adding one on each range and leaving some piercing we can get as many entries as it is possible. The main idea here is that any time that the market reaches these levels we should consider buying a put option in the overbought territory as well as buying a call option in the oversold territory. The striking price, therefore, should be presented by the red or green line in the way that the put option should be only traded once the red line appears. This is the signal that the market is shifting from bullish to bearish. On the other hand, call options should be traded in the oversold territory only in case the green line appears. This means that the market is shifting from bearish to bullish. Using divergences with this oscillator cannot be simpler in any way. A bullish divergence should be observed in case the price is making two lower lows, where the first one is in oversold territory and the second low is failing on the oscillator side. However, by the time the first green line on the oscillator appears, we can suppose that our striking price is at the close of the candle and that we can trade a call option. However, it is necessary to observe the expiration date. The proper date should be chosen since activities depend on a lot on the time frame in which the indicator is being applied. The other way to trade binaries without only using the Accelerator Oscillator is observing the zero level in the way of a continuation pattern. However, it is important to know one thing – make sure to avoid a period of consolidation as well as ranges since this tends to give mixed signals during the period when the market is not trending. To avoid that, observe lower time frames. It is possible that even the five minutes chart can show you good places for buying a short-term expiration date option. The idea here is that price moving downside in aggressive trends should meet the oscillator printing only red lines. From the top to the moment when it crosses the zero level only red lines are shown, which makes it safe to assume that the trend is strong. In that case buying a put option is recommended since we might be expecting trend continuation. Then again, if the market has no straight red series from the top, we can assume that bulls are still present. In that case, it is suggested to avoid trading the continuation pattern. The opposite case is also true. When the market tries to carve a bottom with a green sequence call options should be traded.